Alien life may be thriving in a warm, underground ocean on Saturn’s icy moon Enceladus, according to new research. Scientists say tidal forces could have kept the subterranean sea liquid for billions of years – enough time for organisms to have developed. The mysterious world has a very fragmented and porous rocky interior, ideal conditions for flowing water with the friction creating 10 gigawatts of heat. This amount of energy would light and heat more than 7 million homes – and explains all the global properties of Enceladus observed by Cassini. Earlier this year NASA's spacecraft picked up the first evidence of chemical reactions deep below the frozen crust – suggesting an environment capable of supporting life. It was one of its final successes before plunging into Saturn’s atmosphere at the end of its 12 year expedition to the ringed planet. The latest study published in Nature Astronomy is based on a state-of-the-art computer model using Cassini’s observations. These showed Enceladus has a global ocean fed by intense hydrothermal activity beneath the surface. Its measurements of water escaping from geysers at the south pole showed the sea is salty – and contains organic molecules. But tidal forces within the ice are not sufficient to sustain this activity. Without an additional contribution the ocean would freeze in less than 30 million years. So planetary scientist Dr Gael Choblet and colleagues explored the possibility this additional heating comes from the effect of tidal forces acting on the highly porous core. 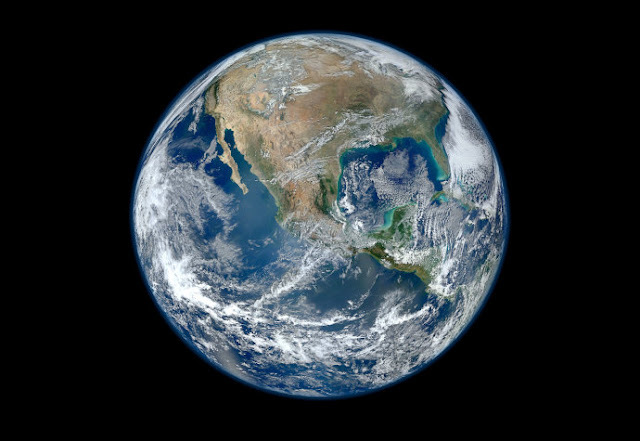 They found enough heat would be generated by the resulting hydrothermal activity to keep the ocean liquid for “tens of millions to billions of years.” This heat is dissipated mainly at the poles – explaining why the ice shell is thinner there. 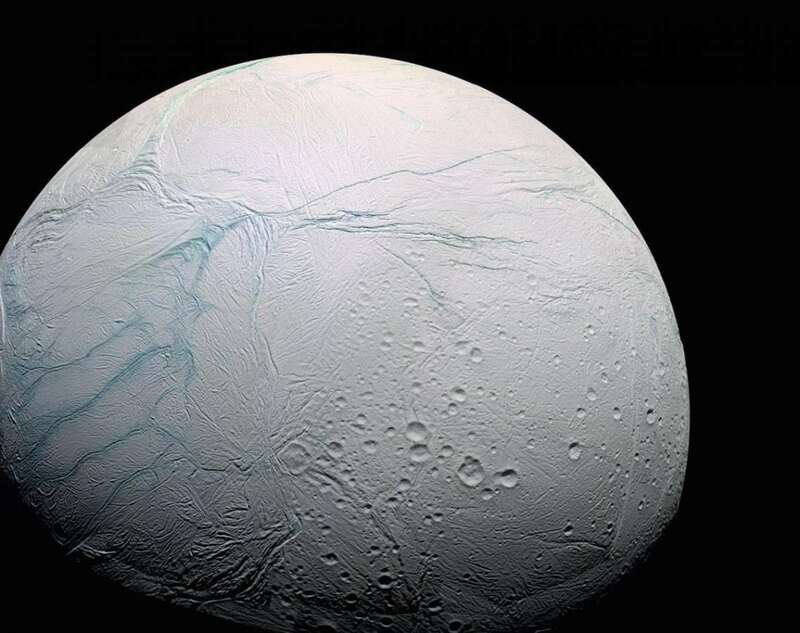 The model suggests an ocean has existed within Enceladus for eons – even though the small moon is only 887 million miles away from the Sun. He said the life expectancy of the ocean and – perhaps more importantly – how long the hydrothermal activity has been occurring would be key to the emergence of microbes and other organisms. 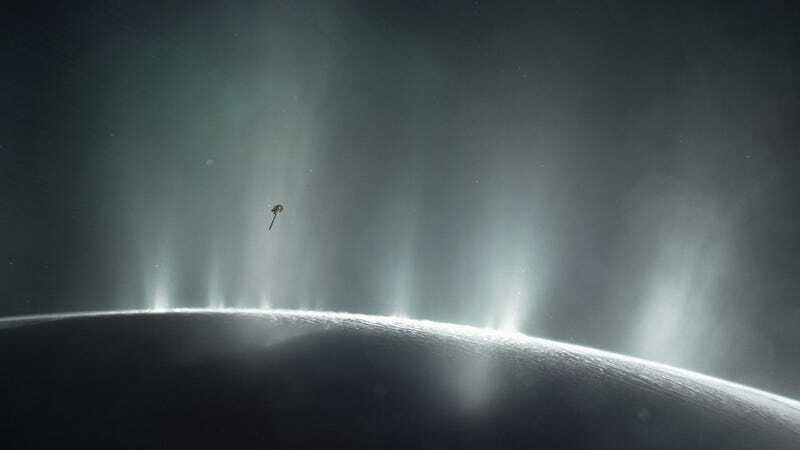 “Only future missions equipped with instruments capable of analysing the organic molecules in the plume with higher accuracy than the Cassini measurements will tell us whether the required conditions have been sustained long enough for life to have emerged on this distant ocean world. Projected missions back to Enceladus are currently under consideration – especially in the US. In October 2015 NASA sent Cassini into a deep dive through one of the plumes of spray which shoot up into the atmosphere through cracks in the ice, and discovered hydrogen and carbon dioxide. Scientists are certain they were created by reactions between warm water and rocks on the ocean floor. Crucially, if hydrogen is present it can mix with carbon dioxide to form methane, which is consumed by microbes in the deep, dark seas of our own planet. Enceladus is the sixth largest moon of Saturn. It is around 310 miles in diameter and approximately 790 million miles from Earth. Scientists had long suspected that liquid water could exist on the moon because of the extreme tidal forces acting on the satellite from Saturn’s gravity. 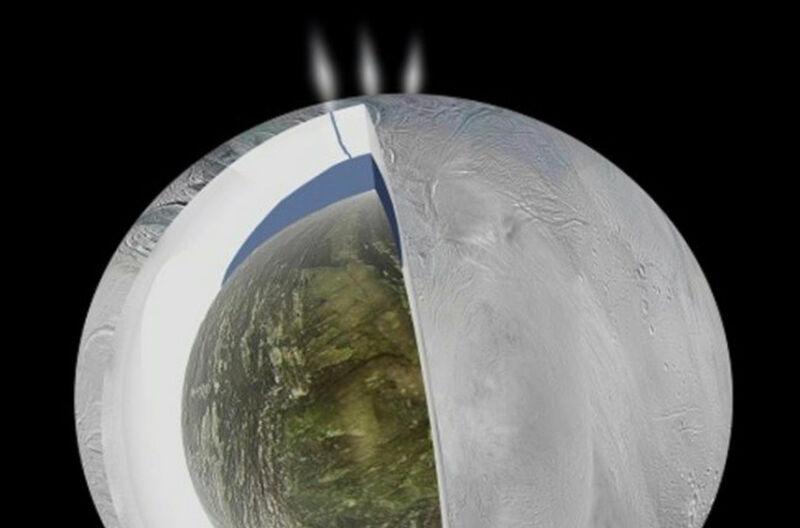 Although scientists previously thought Enceladus’ icy crust was around 13 miles thick, Cassini found at the South Pole it could be as little as three miles deep. The distant moon has long been hailed as one of the three best potential locations for finding extraterrestrial life in the solar system. The others are Mars and Jupiter’s satellite Europa. Such a discovery of even primitive microbes would make it almost certain life is widespread throughout the universe. “Chemical analyses indicate that the ocean is salty and is fed by ongoing hydrothermal activity. Here, we show that more than 10 GW of heat can be generated by tidal friction inside the unconsolidated rocky core. Water transport in the tidally heated permeable core results in hot narrow upwellings with temperatures exceeding 363K (90 degrees Celsius) characterised by powerful hotspots of 1 to 5 GW at the seafloor, particularly at the south pole. Recent data from Cassini has shown that at the south pole, it could be as little as three miles deep.